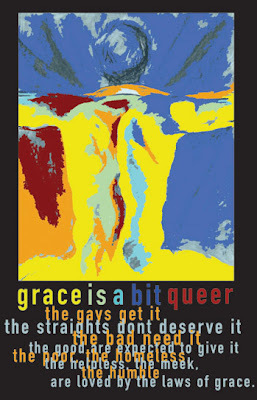 Grace is a bit queer, as social justice artist Felicia Follum points out in a new poster. She is among the artists, musicians and thinkers who are shining a queer light on grace -- undeserved help from God. “The idea for this poster came from my life drawing class. During a critique the class discussed how the model looks like Jesus. It was interesting because the model was a friend who happened to be gay,” says Follum, who often unites art with activism. She lives in Laramie, Wyoming, site of the infamous 1998 gay-bashing murder of Matthew Shepard. Follum decided to explore the Christian concept of grace and combine it with the Christ-like drawing of her gay friend. “From a Christian perspective, the ‘grace of God’ is a fascinating, strange, and almost incomprehensible. 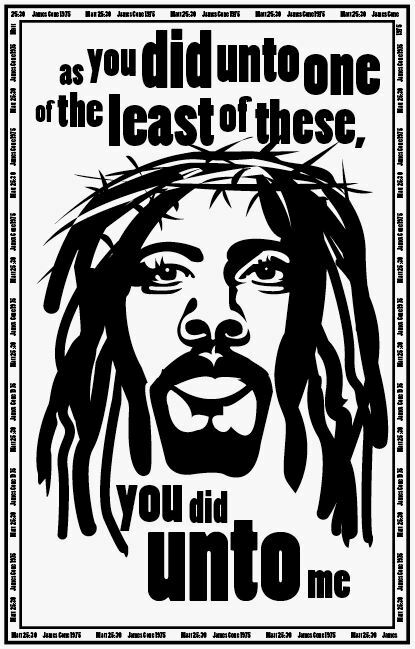 Jesus died on the cross for everyone, including gay people. There is nothing that anyone can do to make God love you less or to make God love you more. That being said, ‘Grace is Queer,’” explains Follum, who earned a bachelor’s degree in art this year from the University of Wyoming. Cone laid the groundwork for Patrick Cheng and other queer theologians who use his approach to liberate LGBT people and our allies. Cheng, who teaches at Episcopal Divinity School in Cambridge, studied with Cone as his doctoral advisor. Cheng discusses queer grace in depth in his latest book, From Sin to Amazing Grace: Discovering the Queer Christ . Avant-garde rock singer-songwriter Richard Haxton celebrates grace in his song “The Spark,” which is quoted above. More of his work is available online at Hawkstown.net, a town / solar system built of Haxton’s songs and drawings, music and art. "Although I initially read this book in a tremendous burst of enthusiasm and delight, it is one of several that I will revisit in depth. This will be facilitated by the exceptional questions for reflection provided at the end of each chapter. Although I deeply regret that I will probably not be able to even scratch the surface of delving into the extensive bibliography Cheng provides, it is wonderful to have so many resources at my fingertips in case I do find myself needing to further investigate aspects of this intriguing theology." Thank you again for the ongoing breadth and depth of your sharing on this blog! I generally like her poster very much, but I'm curious why she says "straights don't deserve it." Good point, Al. Felicia, the artist, is heterosexually married so I assume she is speaking of her own group when she says straights don’t deserve grace. I assume she was referring to homophobic actions by straights against queers. The definition of grace is that it is an undeserved or unearned reward, so I suppose nobody, gay or straight, deserves it. “The good are expected to give it” also puzzles me. It sounds like she is speaking of forgiveness more than grace. I suppose I believe that we (God's children) are expected to extend both grace (more of in a blessing sense I suppose) and forgiveness with all. This idea may come from my Lutheran upbringing.